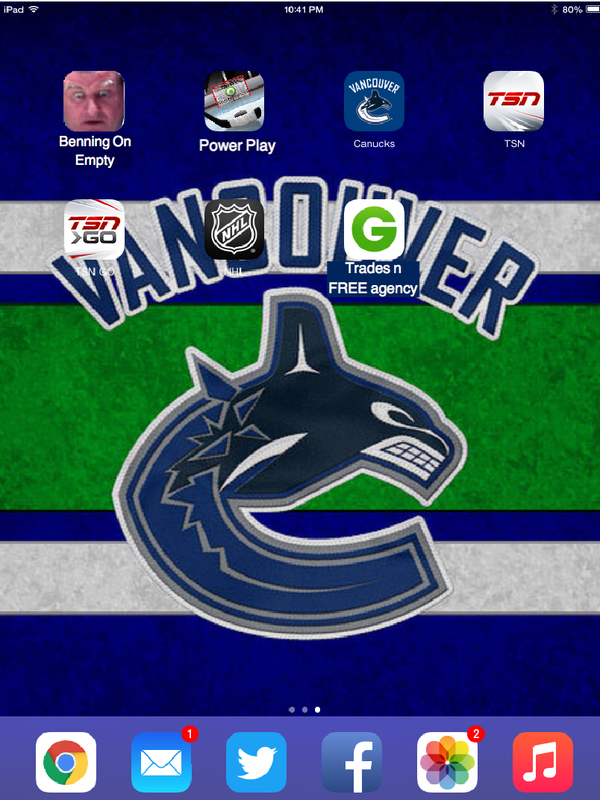 What’s On The Infamous Canucks Team iPad? If you’ve bothered to stay informed with the Canucks through the last quarter of the season you no doubt have heard about the Canucks iPad. It has old Youtube videos, line combination ideas, and plays that never got further than crossing their own blue line. Many listeners of the Pat Cast with Jeff Paterson and Jason Botchford as well as readers of Botchford’s Province articles have heard of the “Chris Pronger videos” the coaches showed Nikita Tryamkin to encourage him to play more aggressive. It obviously didn’t work and Tryamkin bolted back to the KHL. But what else was on this infamous iPad that caused the Canucks coaches to consistently shake their heads in disappointment as the team plummetted down the standings? Well, you’re in luck! I was able to pull some strings and get the password to look around in there. It wasn’t that hard to crack though, “Password1234” was my 3rd guess and Huzzah! it worked. So needless to say, I wanted to share what I found. I do have to warn everyone, there is some shockingly terrifying stuff on here that really makes me wonder the direction this team is really headed. You have to be impressed that the Canucks think so highly of Chris Pronger that they made an app of all his hits and highlights. With the need to find aggression in the lineup and especially through the departed Tryamkin, they probably went too far when they showed him stomping on Ryan Kesler’s leg. It’s conceivable BFG was willing to hit harder and get a bit more aggressive but forcing his skate on someone to cut their leg off was the deal breaker. 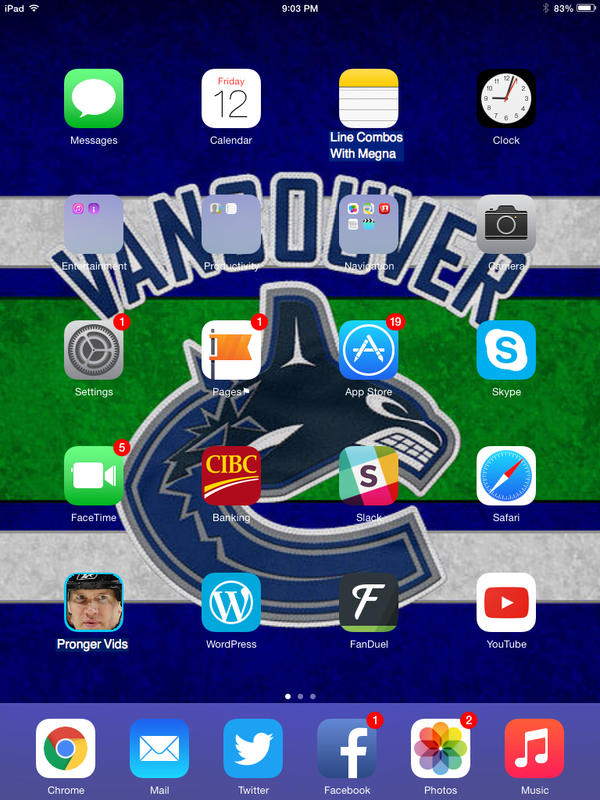 First page looks pretty normal otherwise, looks like the Canucks have their own Slack account. Smart to have a working message board there. I did notice that they modified the NOTES app to be exclusively about Jayson Megna. Kind of disturbing if you ask me, but when he was out on the ice in every situation, I suppose having quick access to who plays well with Megna is a good idea? The biggest shocker for me was seeing that they subscribe to Jyrki21’s “Benning On Empty”. This comic strip is so much bigger than I gave it credit for. Don’t get me wrong, it’s hilarious every single week and he really crushes the takes from a unique angle but the fact the Canucks follow him and made an effort to be a tap away from reading, that’s awesome! A power play app makes sense to have. When they’re in the heat of the action, looking at some quick ideas or successful setups could make the difference between losing and advancing in the playoffs. 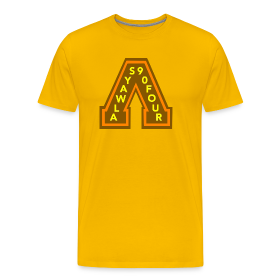 OK, not THIS team quite yet, but you get the idea. As the Canucks struggles on the man-advantage increase ten-fold this past season, the power play app seems like a welcome addition to the team. It couldn’t make them any worse, that’s for sure! There was one app I was kind of questioning for awhile and that is the Groupon app. The one I know has deals on food, shopping, hotels, and some questionable items that you probably shouldn’t be looking to get a deal on. What I found was that the NHL has a player transaction app kind of like the EA Sports games where you can sign, trade and scour the market for additions under the Groupon app logo so no one is the wiser. It wasn’t hidden that well as I only had to swipe right a few times. I’m glad there wasn’t a Tinder app on here, I really don’t know how I would have handled that. Makes sense, finishing the season with a PP of 14.1% would be worth deleting that app. It was suggested on Twitter, in the papers and on the airwaves so it makes perfect sense that the Canucks gave up on the man-advantage as well. 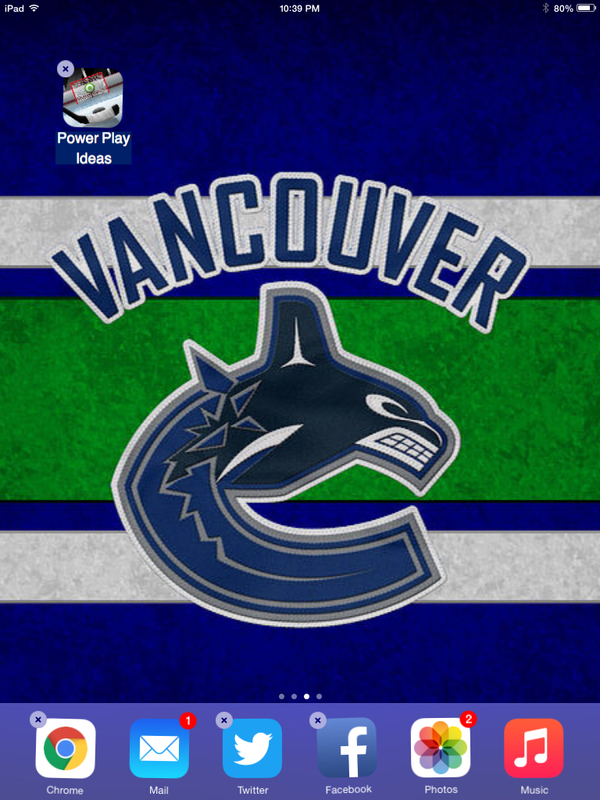 So there you have it, the Canucks iPad in a nutshell. Not too glamourous but it should help set some things straight on how this team operates on a day-to-day basis and what goes on during the game. Imagine what their Apple Watch would look like? Save that for another day.